workplace diversity, discrimination and empowerment, corporate social responsibility, and welfare-to-work programs. In an article, published in the Journal Social Work, Mor Barak provides the first articulation of The Inclusive Workplace construct, which she has coined. Mor Barak created and tested a measure of diversity perceptions in the workplace (published in Journal of Applied Behavioral Sciences), and a measure of inclusion in the workplace (published in Administration in Social Work). Validated on large samples, both measures are presently used in several studies to evaluate the extent to which employees of diverse backgrounds feel excluded in work organizations. Dr. Mor Barak has published extensively in the area of diversity and inclusion industrial/occupational social work, stress and social support. She authored two books entitled Social Work Networks and Health (Garland publishers, 1991), and Social Services in the Workplace (Haworth publishers, 2000). Prior to her current academic appointment, Dr. Mor Barak held a number of corporate positions and has worked in clinical practice, program development, and training and consultation. She has conducted studies evaluating corporate sponsored health clinics, investigating the determinants of successful linkages between job seekers and employers, and evaluating employees diversity perceptions. Her recent work focuses on the development of national and international collaborations under the Center for the Inclusive Workplace. 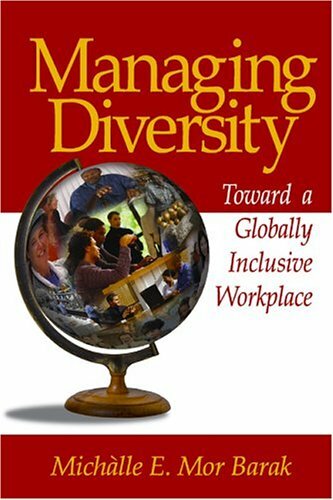 Encompassing a broad array of activities that constitute the inclusive workplace model, the Center engages in projects such as diversity training, mental health of employees, discrimination and empowerment, corporate social responsibility, and the inclusion of former welfare recipients in the organizations mainstream activities. Through its national and international activities, the Center strives to improve the health and mental health of individuals and families in their work organizations and in their communities. She teaches research and social work practice in work settings in the School of Social Works graduate program, and the two-semester statistics courses in the doctoral program. She has served on a variety of school committees including Faculty Council, and is active on several community boards. She has received several invitations to prestigious organizations and gatherings. Among them, delivering the keynote address at the Annual Meeting of the National Association of Industrial Social Workers that was held in Tel-Aviv, Israel, in May 1996; a series of lectures on international aspects of workforce diversity in Yonsei University and Ehwa University in Seoul, South Korea and in Doshisa University in Kyoto, Japan ; conducting a two-day workshop on Diversity, Inclusion and Commitment at the U.K.s National Institute of Social Work in London, in May 1999; Her publications were disseminated through the Migrant Unit at the United Nations International Labor Organization (ILO ) to organizations around the world; and, she was honored as a guest of President Kim De Jong in a five-member VIP delegation to South Korea.